Poly-Crete Services - New England Surface Preparation Inc. Formulated to withstand aggressive chemical and thermal attack, Poly- Crete™ is the answer for the most abusive environments. Poly-Crete HF™- Quickly becoming the industry standard for the "Go To" product for tough applications in commercial kitchens and food processing facilities. Poly-Crete HF is a troweled on aromatic cementitious urethane that is typically applied at 1/4" to 3/8" thick. Poly-Crete HF performs exceptionally well whenever there are extreme demands placed on your floor due to high temperature wash-downs, acid/caustic spills or just the rugged abuse from most production facilities. Poly-Crete MD™- A 100% solids, aromatic cementitious urethane system blended with graded silica and fine fillers applied at 3/16” to 1/4” to produce a self-leveling matte finish of uniform color. With the addition of various types of broadcast media (eg. quartz and decorative chips) Poly-Crete MD can satisfy the needs for extreme durability without sacrificing the needs for a decorative, attractive floor. Poly-Crete SL™- A 100% solids aromatic cementitious urethane that is applied at 1/8" as a self-leveling slurry. Poly-Crete SL accepts a broadcast and is very tolerant of high concrete moisture levels (12 lbs MVT). In many cases Poly-Crete SL has replaced existing resinous floor specifications with an easier to apply, more durable floor. Poly-Crete SL is perfect for fast track building schedules where epoxy delays cannot be tolerated. Poly-Crete SL is also the foundation for all Hybri-Flex systems. Poly-Crete CF™- As Poly-Crete products have increased in popularity the customer demand for a UV stable topcoat (with a glossy appearance) has been answered with new Poly-Crete CF, an aliphatic cementitious urethane. This revolutionary topcoat product is the perfect solution for a color stable floor that is not affected by UV light. 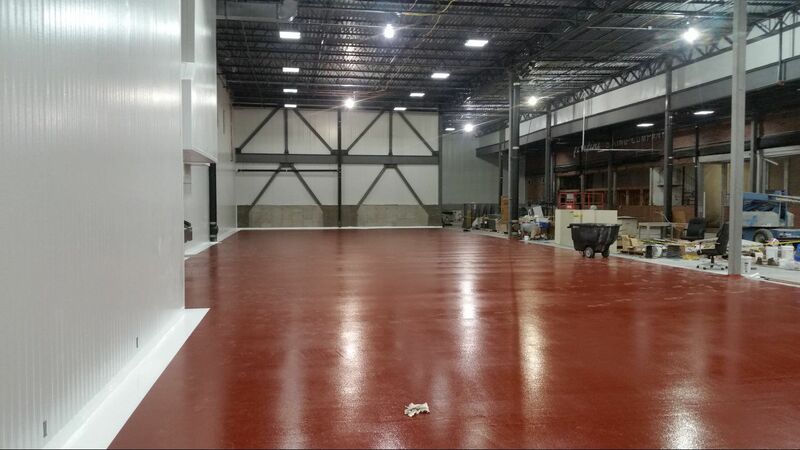 Use Poly-Crete CF to refresh your existing cementitious urethane floor to "like new" standards for a fraction of the cost of the original floor.